Instructions and tips for follow-up and variations are included for each activity, and an additional chapter provides valuable advice for working through unexpected difficulties in team-building. Instructions and tips for follow-up and variations are included for each activity, and an additional chapter provides valuable advice for working through unexpected difficulties in team-building." 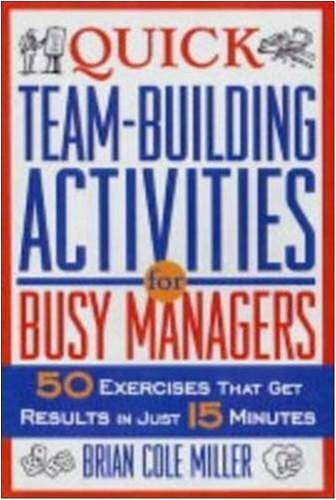 a) This book delivers what it advertises: Quick team building activities. There's a surprising amount of variety and thought behind the book. It's organized and clear. The goals and methods are obvious. b) As with everything in life, the success of the activities depends on you. And some luck. And you're going to have to take some chances. c) The book is arranged by Need (ingenious, really). Say that your team is a bickering crew of backstabbing narcissists that fail to realize the inherent talents of their teammates. Flip to Chapter X and you'll have an activity that helps them understand the value of others. It's like a Jedi mind trick. d) Stylistically, I can use about 1/3 of the activities in the book today. As teams and groups change, the other 2/3 of the book provides buffer. A few of the activities will never match my style - or yours - but that's Ok; that's the way things work. We don't all like Merlot. e) Overall, (5) stars for delivering what the title promises (do what you say...), and an equal (5) stars for simple, valuable activities. f) ps - One that I didn't see in the book is the Truths and a Lie game (maybe because it's everywhere on the net). Here it is: Give everyone (3) index cards. Have them write (2) True Statements and (1) False statement about themselves on the cards. Merge and Shuffle, Read each out loud and try to figure out who said what. It's a fun get-to-know-ya to kick off a project. Most of us don't really know our coworkers, so it works in all situations. It gives you great ideas for ice breakers, however most of the time I find myself tweaking the exercises as I find some of them lacking in creativity and excitement. Over all this book is a good last minute reference should you find yourself in a bind for ideas. This book brings together several mutually-supportive elements: managers with heavy, fast-moving schedules; team members who want to feel a greater sense of belonging; and an era that demands higher levels of collaboration....teamwork. The book is organized into two parts. The first section is instructional; the second section consists of bullet-pointed presentations of fifty short easy-to-run exercises. The opening section has two chapters that are worth the price of the book all by themselves: How to Run a Successful Team-Building Activity and What Could Go Wrong with a Team-Building Activity. What a sense of security this section gives managers: these activities are simple to use...and your experience is practically fail-safe. Each of the activities is presented using the same format. The bullet-point sections are This is, The Purpose is, Use This When, Materials You'll Need, Here's How, For Example, Ask these Questions, Tips for Success, and Try these Variations. It doesn't get much more comfortable than this! Understanding today's work environment, Miller promises no role-lays, demonstrations, outdoor activities, handouts, or touchy-feely stuff. The activities are organized by areas of need: Communication, Connecting, Cooperation, Coping, Creativity, and Teamwork. A strong index complements the well-organized table of contents, making the volume highly user-friendly. This is just what I've been looking for!! !